Which Has a Better Affiliate Program: Azartmania or Lucky31? Azartmania Casino and Lucky31 Casino are two gaming hubs that cater to different types of players. While both casinos offer fan-favorite games such as slots, blackjack, roulette, and more, they differ in target markets. Azartmania caters to players only in Russia, Kazakhstan, Ukraine, and other countries in that region. On the other hand, Lucky31 welcomes players from different countries except those in the US and certain parts of Asia. Like many casinos, Azartmania and Lucky31 have affiliate programs that encourage webmasters like you to bring in more players. Both these programs are under providers that handle several brands, giving you the chance to make money by promoting multiple casinos. But if you would rather focus on inviting players to join only one gaming hub, you can do so as these programs do not have a bundling system. You will not have a problem marketing either casino as they offer hundreds of games. The only difference is that Lucky31 has 800 titles from popular game providers like NetEnt and Microgaming. Meanwhile, Azartmania provides only 200 games from lesser-known software developers. Still, both gaming hubs will boost the bankrolls of casino gamers because of rewarding bonuses and promos. But which affiliate program is more suitable for you? To know the features of both programs in better detail, read through this Azartmania vs Lucky31 Casino Affiliates review. Both Azartmania’s and Lucky31’s referral programs offer rewarding revenue share rates. Azartmania lets you earn a 50% commission. This rate can go up to 75%, depending on the revenue your referrals bring to the casino. If you think you deserve a higher rev share rate, contact your affiliate manager. Unfortunately, rev share is your only option to earn when you are under Azartmania Casino Affiliate Program. On the other hand, if you are a Lucky31 partner, you can choose from among three commission structures. Once you sign up, you will automatically get 50% commission in your first three months. After that, you can continue earning rev shares at a 25% rate, or you can choose to earn through the CPA deal or hybrid deal. You can also add sub-affiliation to your earning plan. Based on commission plans presented by the rival programs, Azartmania Affiliate Program has the upper hand. Even if you have more options to earn on Lucky31, Azartmania gives you a higher rate. You also have a chance to increase your rev share rate based on the revenue generated by the casino from your referrals. The key to effective Bitcoin affiliate marketing is having the right promotional tools. This is why both Azartmania and Lucky31 affiliates get materials that will help catch the attention of potential members. Both programs also send detailed statistical reports so that partners like you are aware of how much traffic the casino gets through the marketing tools on your site. If you are a partner of Azartmania, you will receive a banner rotator that changes content whenever the casino has new promos. But if you want to increase traffic in your site, you can ask your affiliate manager for customized marketing tools. Meanwhile, if you choose to promote Lucky31, you will get the usual Flash and GIF banners. But what makes the program stand out is that it offers demo versions of the casino games. This gives players a chance to experience what it is like playing in the casino. It also customizes promo materials upon your request. While both Bitcoin casino affiliate programs give you campaign materials, Lucky31 has a more unique offer. Its demo games will definitely add more impact to your marketing venture. On the other hand, Azartmania gives you only one promo tool. Both Azartmania and Lucky31 ensure that you will get your commission on time. They also give you a choice to receive your earnings in USD, EUR, or BTC. In addition, the affiliate programs have the “no negative carryover” feature. This means your negative balance will not affect your earnings the following month. If you want to promote Azartmania, you will get your earnings twice a month. The program lets you cash out using your debit card, e-wallet, or SMS. The good news is that there is a low payment threshold of US$10. And because there is no withdrawal limit, you can take out whatever amount you want. The only shortcoming is that you have to manually request for your payment. On the other hand, if you choose to become a Lucky31 partner, you will automatically receive your payment every 10th of the month. However, your cash-out options are limited to electronic transfer, e-wallets, and player account transfer. Moreover, the program has a higher payment threshold of US$50. In this case, Azartmania has a more favorable set of withdrawal terms. In terms of support channels, the affiliate program of Azartmania provides more options. If you want to contact your affiliate manager, you can do so through Skype, hotline, or email. All of these methods are available 24/7. In contrast, Lucky31 Affiliate Program gives you email as the only communication method you can use to get support from the affiliate program’s staff. Still, the program assures you will receive a response within 24 hours. Verdict: Azartmania vs Lucky31 Affiliates? 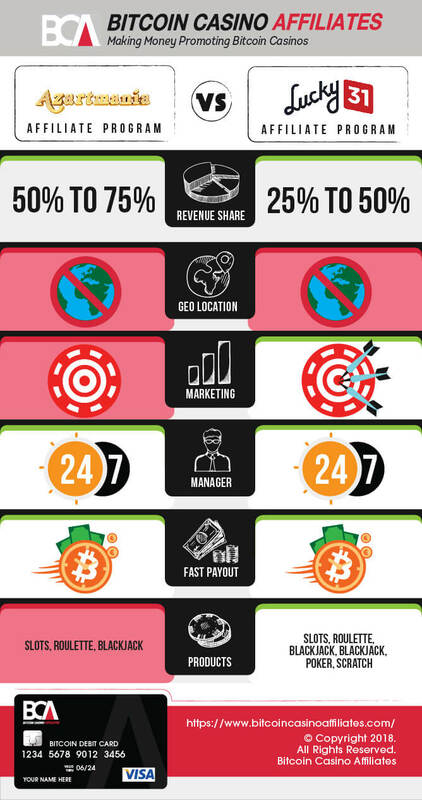 The affiliate programs of Azartmania and Lucky31 are neck and neck in terms of features. Both offer high revenue share rates and reliable payment terms. They also provide regular reports so that you can fine-tune your marketing campaign. But if you have to choose between the two affiliate programs, you should sign up for Lucky31 Affiliate Program. For one, it is easier to promote the casino because it has fewer country restrictions and a bigger game library. Plus, the demo game versions will help you invite more players to join the casino. While Azartmania offers a high revenue share rate, Lucky31 Affiliate Program lets you choose from among three earning plans. Even if you revert to a low commission rate after your first three months, you have an option to change your commission structure. Finally, you will enjoy automatic monthly payouts. This saves you the time and effort of manually requesting a withdrawal. And you can rest assured your balance next month will not be used to cover up for your negative balance in the current month.